Printed with our own "Flowgee" design in a stunning and vibrant shade of Radiant Orchid (yes that is a fancy name for fluoro purple). The cushion measures 42cm, to suit a 45cm insert (not included) and has a double fold cover on the reverse and fixes with a gorgeous handmade Glory Box button. This playful print would make an excellent addition to a little girl's room to make her feel a little more grown-up. Printed on a broderaise-englaise poly cotton, it is an easy care tactile delight. As with all of our Glory Box prints, they are made from scratch in-house by Lara, our designer. This particular print was inspired by the scrummy mangosteen, a tropical fruit that reminds her of the old days when she lived in China. Printed onto embroidered and traditional broderie anglais the fabric is also reminiscent of her first 'grown-up' bedroom. By mixing the modern bold graphics and bright colour with traditional fabric and a wallpaper style damask ogee repeat, this design is a nice twist on tradition- as is the Glory Box way. 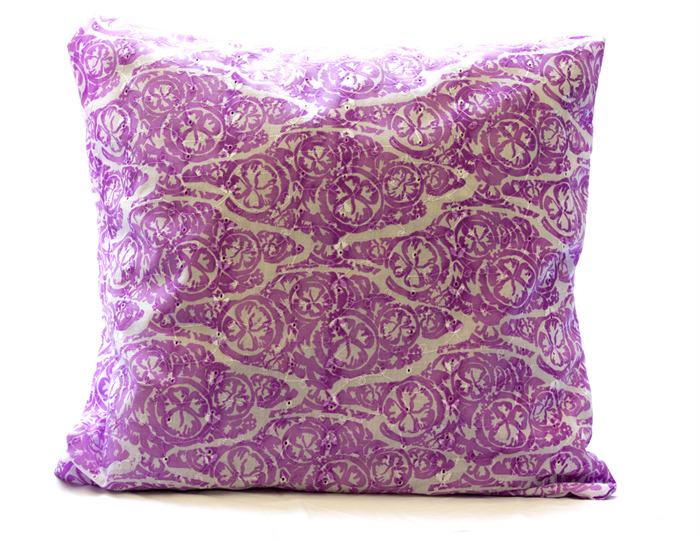 This is a stocked fabric so if you prefer a different size cushion, or you would like fabric to make your own item with, please email us and we will do what we can to help you get this print into your life.